I love my wife. Like, I love her silly. And you know what the best part is? She loves me back. So on this day, her birthday, I look Hoang to the Gores Pavilion to once again get the opportunity to pretend for a few minutes that she lives in a Harvard Five creation. 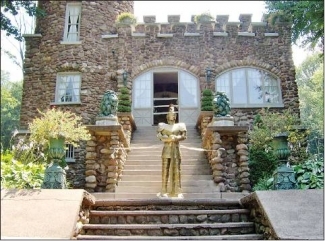 Even if Landis Gores is the least-known of the Five and even if this was just a pool house. Anyway, if you are reading this page that tells me you at least care a little bit about modern architecture. And upon seeing New Canaan above you may have said to yourself, “Ah, one of the centers of mid-century design!” And good for you. 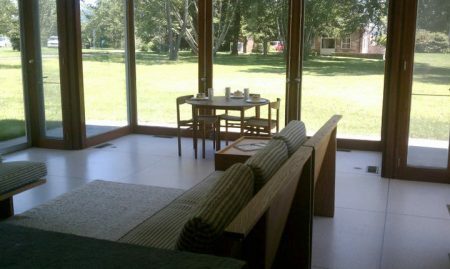 Attentive readers remember our visit to Philip Johnson’s Glass House – also in New Canaan – and how Hoang actually had a rather important hand in its status as a National Historic Landmark. Anyway, in 1946, Pamela and Landis Gores purchased a four-acre lot to construct their first home in New Canaan. 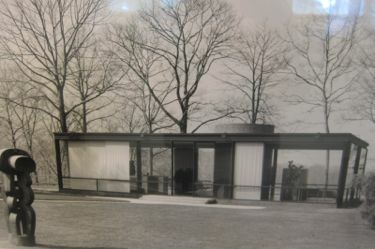 The house, which is still standing and owned by the Gores family, was one of the first Modern houses built in New Canaan. Across town is the Gores Pavilion, located in Irwin Park off of Weed Street. 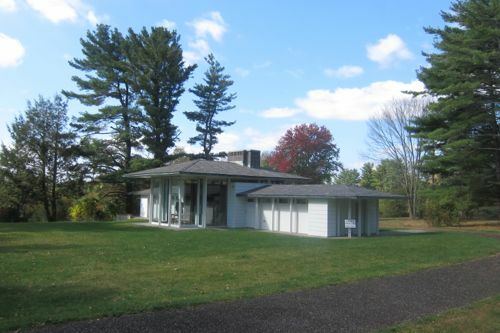 It was built in 1960 and is but one of scores of modern buildings in New Canaan. Gores’s clients were Jack Irwin, U.S. ambassador to France and an Undersecretary of State, and his wife, Jane Watson, whose father was the founder of IBM. 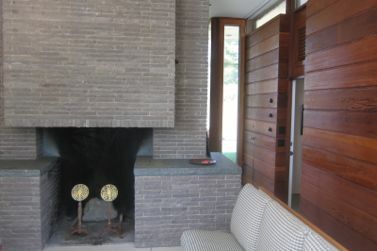 Designed as a pool house and personal lodge for the Irwins, it is set about a hundred yards from the Irwins’ more conventional house, in New Canaan’s Irwin Park. 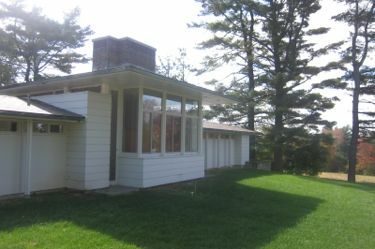 When it was threatened with demolition in 2006, supporters of modern architecture, led by the New Canaan Historical Society, rallied to protect it. We arrived and drove through Irwin Park to the back lot where the Pavilion stands. It’s not large by any stretch and the pool itself has been filled in. 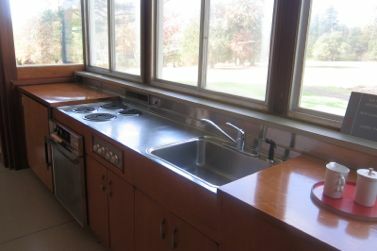 it is, however, still a lovely little piece of mid-century beauty. 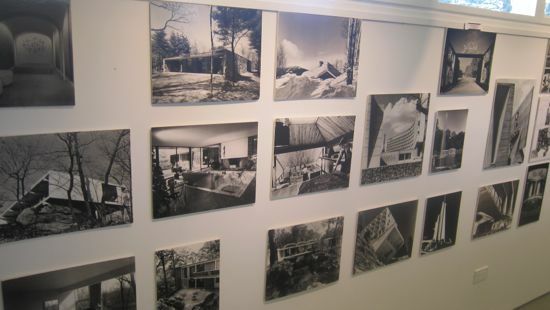 During our visit, there was two exhibits – and I assume the one about the New Canaan moderns is more or less permanent. The temporary one, Pedro E. Guerrero, 1917-2012, Photographs of Modern Life was a very nice retrospective of the moderns around the country, with a focus on the local area of course. Photographer Pedro E. Guerrero began his photographic career in 1939 when acclaimed architect Frank Lloyd Wright (1867-1959) retained him to document his buildings and his Taliesin Fellowship of apprentice architects. 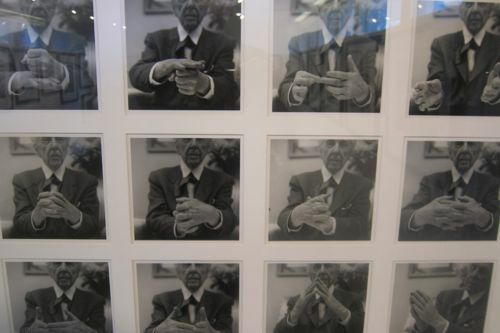 Over a span of 20 years, Guerrero recorded Wright and his work becoming the master architect’s chief visual interpreter. Guerrero worked for all the major architecture and home magazines in the 1940s-1970s. His work has been exhibited at major museums and galleries in the U.S. and in Europe and has been featured in books, magazines and documentary films. Through the work for magazines and such, Guerrero documented buildings modernists from Eero Saarinen to Joseph Salerno. Quick, name a building in Connecticut that each has designed? 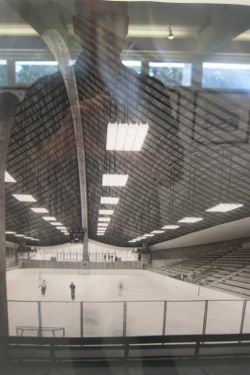 I’ll go first: Ingalls Rink at Yale (my visit, here and a bad picture of the picture just below) and United Church of Rowayton (which is a cool building). He also photographed the work of “The Harvard Five,” which I supposed I should name if you don’t know already: John Johansen, Marcel Breuer, Gores, Johson, and Noyes. Guerrero approached the modern buildings as sculpture rather than functional architecture. Wright features the most prominently in the work, but enough of the Harvard Five guys were represented in the exhibit to make us happy. We crossed through a small kitchen area to access to other wing of the pool house. 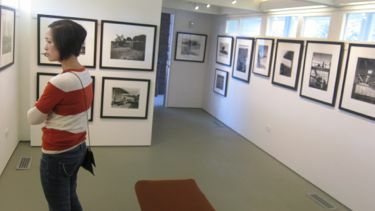 Here, there was another photographic exhibit. 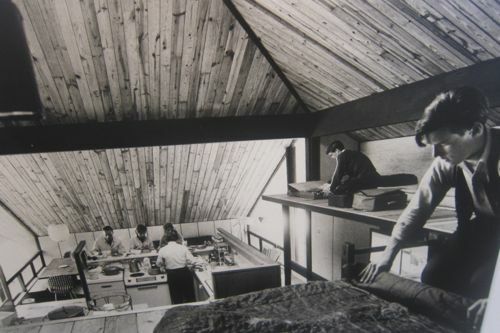 This time, it was a “Second Look at New Canaan Architects, 1953-1983.) I guess we missed the first look when the Pavilion first opened after its restoration. All the usual suspect (photos) are here. Still, it’s always cool to note how important, relatively, the New Canaan scene is in the world. It truly is one of the centers of modern architecture in the entire world. There were more here than the famous Harvard Five, but those are of course the main guys. Each of the five brought a slightly different perspective to architecture. Philip Johnson was the eloquent experimentalist. Gores was interested in the early work of Frank Lloyd Wright and his singularly American view of architecture. Noyes, who was imbued with functionalism, experimented with new concepts of plan and building enclosure. Johansen became innovative in his use of form, plan and materials. Breuer, steeped in the purist tradition of the International Style, remained its spokesman. The photos in the exhibition included many of students’ work of the Harvard Five. 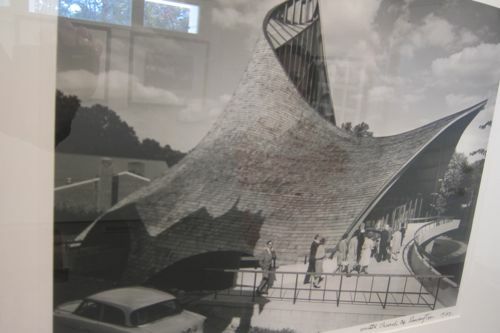 Their buildings are, of course, all over the world and in the brochure’s words, “included in the exhibit are personal interpretations and re-thinking of the International style, restorations, eclecticisms, and post-modern allusions to our past. Who’s the guy on the right? No, she did not. And I certainly didn’t. The lady then said, “If you were a good republican, you’d know.” As neither of us would qualify for that, we gave up. Of course you don’t. How could you? It’s apparently Paul Bremer, the Iraq War buffoon. The lady walked away in triumph. I have no idea why, as her question was ridiculous. I just looked up Bremer and learned, “Born in Hartford, Connecticut, Bremer was educated at New Canaan Country School, Kent School and Phillips Academy. Bremer’s father was president of the Christian Dior Perfumes Corporation in New York. 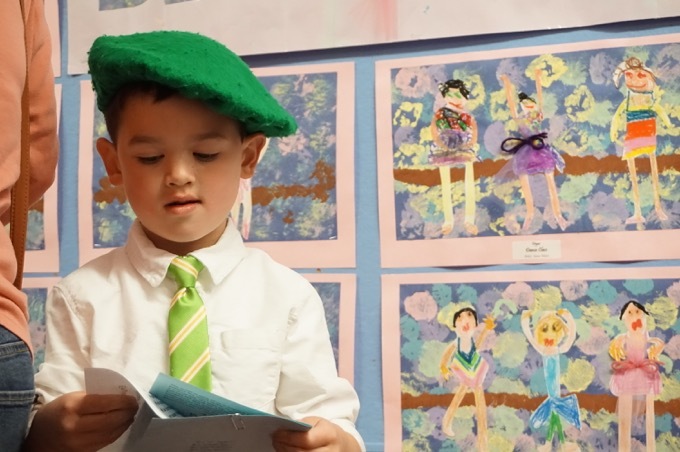 His mother was a lecturer in art history at the University of Bridgeport. Bremer graduated from Yale University in 1963…” So yeah, lots of local history in his bones. So what’s the connection? Landis Gores designed a few of the buildings at the New Canaan Day School where Bremer was a student. But I should mention how cool I think it is that New Canaan (and Westport too, to some degree) has embraced their modern history with such gusto. They have come to recognize their place in history may really only be 50-70 years old – but just as important as anything else in Connecticut. Risom lives in New Canaan too and was one of the first designers to bring traditional Scandinavian values of function and craftsmanship to America. The guy has been prolific and much-awarded. To me, his stuff is nice but I wouldn’t seek it out. There are certain conversations like the one with the lady about her furniture which you will really only hear in New Canaan, CT. Randomly, here’s a Yelp review of some bakery in town, which sums up the town beautifully. And since it was Hoang’s birthday, and since she’s stunningly beautiful, I’m going to pop in a picture of her here from very late at night that night in Manhattan. I am one lucky man. The Bremer family had a house in New Canaan by Eliot Noyes. There’s a photo of it here. Nice house, whatever the political connections. Oh wow, thanks. Yet another beautiful Noyes effort.